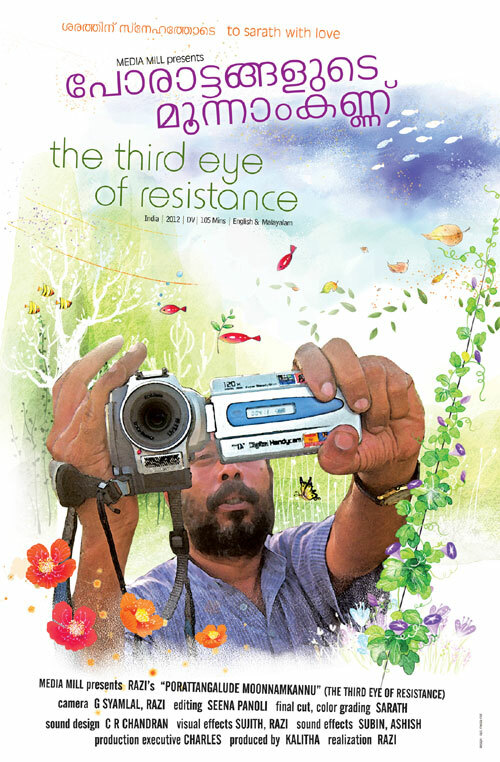 "The Third Eye Of Resistance" is a documentary on the life and work of C. Saratchandran who passed away in an accident in 2010. It is a journey through the life of Sarat, as he was fondly called, who travelled constantly with the camera and cinemas. It is a journey through the vivid, living memories of the protesters at Chaliyar, Plachimada, Muthanga and Kathikudam; through the experiences of his friends and everyone who have travelled with him or parallel to his path. As someone who pioneered in media activism as part of the little magazine movement during the Emergency, Sarat later on took up the very political duty of documenting the popular struggle movements of Kerala. C. Saratchandran was born on 16 February 1958. Had his education in MG College, Trivandrum and at Dharmadam. During his student years, was involved in the resistance/movement against emergency. After obtaining his graduation, he traveled all over India, working as an accountant in a construction Company. His apprenticeship in filmmaking was from Late Sri. G Aravindan, and the Late John Abraham. During the 1980’s he was involved with Samkramanam, a radical magazine published from Kochi. He was also involved with the agitation for conservation of Silent Valley .For ten years; he worked in Saudi Arabia as Education Promotion Consultant for the British Council. He was one of the first to realize the potential of the new electronic media in the 1980s. In the late eighties he started making documentary films on VHS. He also took it as a mission to screen his own films and others’ films on people’s issues throughout the length and breadth of Kerala and the neighbouring states. Saratchandran often become an active participant in the struggles he documented. His screenings played a pivotal role in raising public awareness on environment and giving focus to the debates on environmental issues and people’s struggles in Kerala. He was the co founder and active organizer of the VIBGYOR film festival. He was the artistic director of ViBGYOR 2010 at Trisshur which concluded recently. He was also a prominent supporter of VIKALP, a platform to defend freedom of expression and to resist censorship. A known Under Construction filmmaker, C. Saratchandran was known for films like Save the Western Ghats March: The Kerala Experience (1987); No to Dams: A Pooyamkutty Tale (1988); Ellam Asthamikkum Munpe(1989); Kanavu (Dream), a film on a tribal children’s commune in Wayanad (2001); Evicted from Justice – a video report on Muthanga massacre (2003); Your’s Truly John, a video essay on John Abraham, the film maker (2008); and To die for land – the ultimate sacrifice, on Chengara land struggle. 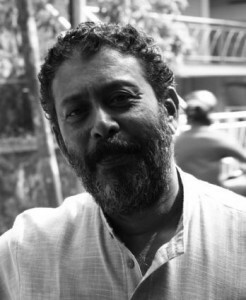 He was also, involved in the making of: Living in Fear (K P Sasi) 1985; The Eighteenth Elephant – 3 Monologues ( P Balan)2001 Purooravas a Malayalm feature film (Sivaprasad)1986; Narmada A Valley Refuses to Die (K P Sasi in 1989); Ek Alag Mausam a Hindi feature film (K P Sasi ) 2000; The Turtle People( Surabhi Sharma) 2002. Express Highway: The Road to Destruction (Sanju Surendran) 2004. Razi, Director of "The Third Eye Of Resistance"
The documentary will be screened in 30 locations around India in the next two months. Here is the schedule.